Lube-free, long life. Tsubaki's new and improved eco-friendly Lambda Chain. 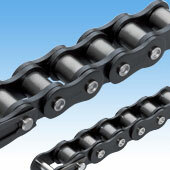 No lubrication for chain is required due to using special contained bush. 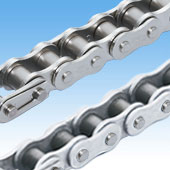 Reduce the frequency of chain replacement and amounts of industrial waste. Avoids stains of additional lubrication on the equipment, and keep work environment clean. Please be aware that NSF-H1 non-compliant rust prevention oil and oils for building are also attached in the process of manufacturing. Our basic Lambda Chain model. 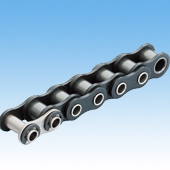 Interchangeable with standard roller chain. The definitive lube-free roller chain. 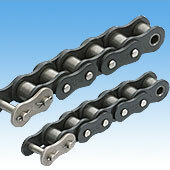 More than 5 times the wear resistance of Lambda Chain through the use of oil-impregnated felt seals. Our special lubricant with food-grade resist degradation and exhibit superior wear performance in high temperature environments (150°C to 230°C). 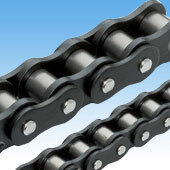 The plates and rollers of our Heavy Duty Lambda Chain are surface-treated to increase corrosion resistance. 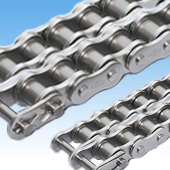 Lambda Chain that conforms to ISO 606 B series standards. 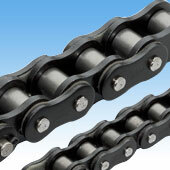 The dimensions are fully interchangeable with existing BS chains. 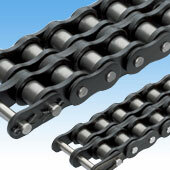 This sideflexing roller chain offers large lateral bending capabilities thanks to its uniquely constructed pins and bushes and large clearance between link plates.